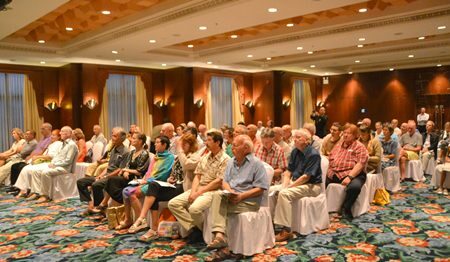 It’s rare to sense an audience so enraptured by a musical performance but that seemed to be the case at the recent piano recital at Siam Bayshore Hotel. 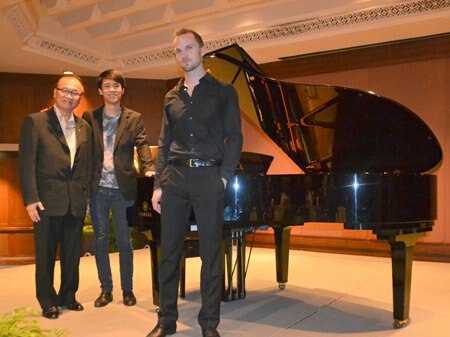 The concert featured the young award-winning pianists Benjamin Kim and Andreas Donat with a programme of solos and piano duets, presented by D&M Music Studio in cooperation with Yamaha Ratchada Music School. The programme was introduced by Mongkol Chayasirisobhon of D&M Music Studio and opened and closed with two of Schubert’s finest works for piano duet. The Fantasia in F minor dates from 1828, the last year of the composer’s short life. It was perfectly suited to demonstrate the pianists’ superb articulation, their brilliant sense of rhythm and their clear and expressive phrasing. Their ensemble playing was exemplary and the dry acoustics of Siam Bayshore’s Park View Hall enabled the audience to hear their performance in crystal-sharp clarity. 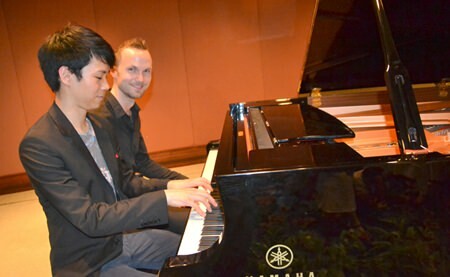 The concert featured the young award-winning pianists Benjamin Kim (front) and Andreas Donat (rear) with a programme of solos and piano duets. The Schubert duet that closed the programme was probably more familiar, being one of the great classics of piano duet literature. His Eight Variations on an Original Theme is a good deal more exciting than the prosaic title suggests, and the daring harmonies must have sounded very modern to contemporary Viennese audiences. Ben and Andreas gave a thrilling performance of this demanding work and I was struck by their sensitivity to the ever-changing dynamics and their sense of ensemble. (L to R) Mongkol Chayasirisobhon, Benjamin Kim, Andreas Donat. But despite these brilliantly performed piano duets, I was particularly impressed with the solo playing. Young American pianist Ben Kim played Chopin’s Piano Sonata No. 2 in B-flat minor Op. 35, popularly known as The Funeral March. His playing of the impassioned and technically demanding first movement was impressive to say the least, but I think it was the slow movement, which includes the well-known funeral march that captivated the audience most of all. Ben Kim brought solemnity and a kind of dark, ominous grandeur to the funeral march theme, but it was the lyrical contrasting section in D flat in which he had the audience spell-bound. He played this quiet reflective passage with exquisite tenderness and eloquence. It sounded magical. It’s rare to sense an audience so enraptured by a musical performance. The young Austrian pianist Andreas Donat brought colour, excitement and the flavours of Spain to the concert with his bravura performance of the last two movements – and the most difficult – from Ravel’s piano suite Miroirs. He gave a beautifully dream-like reading of Une barque sur l’océan. His playing was sensitive and thoughtful and he seemed to have a profound understanding of Ravel’s musical landscapes and tonalities. He showed exceptional control of rhythm, phrasing and dynamics and gave a brilliant performance of the sprightly Alborada del gracioso, a highly colourful and percussive Spanish-influenced piece. It’s also tremendously difficult too, with fast staccato repeated notes and rhythmic figurations. His confident performance of this challenging work was exciting and impressive. For their encore, Ben and Andreas played a short work which contains Schubert’s most well-known melody. It’s the first of three military marches for piano duet and provided a light-hearted end to a splendid concert.